This blog is mainly the experiences of one American chaplain at war, but also in peace. It’s told in multiple threads from various assignments around the world to include three from deployments to Afghanistan, Iraq and Korea and an assignment to Alaska. Some pages will bleed thoughts, fears, frustrations, joys, challenges and blessings; others will resemble travelogues. People may argue that an assignment to Korea isn’t really a deployment, that we’re not really on the front lines or at war. But come to Korea (in uniform) and you will see things differently. Nearly from day 1 on the peninsula, Service Members are reminded that North and South Korea remain in a state of war. The armistice that was signed in July of 1953 did not end the war but rather just allowed for a cease-fire (in fact, South Korea wasn’t willing to -and did not- sign the armistice agreement). There are not many news cycles that go by without some reminder of how fragile “peace” in Korea really is, so military members from all branches remain vigilant and in a constant state of readiness, prepared to respond to an attack from the north at a moments notice. Certainly, Alaska is not a war zone, though being so close to the eastern region of Russia it could turn into one quickly. Really it is a war against the elements, with temperatures dipping as low as -60 in the winter at Fort Wainwright with the summer mosquitoes on the scale of an Egyptian plague. The United States has bases there to ensure that we have forces ready to deploy to the coldest and most arid regions of the world so the climate is often unforgiving during the winter but beautiful in the summer. The Alaska page will explore the challenges and joys of life serving as a chaplain near the most northern point of the United States. As you read through the different posts, you’ll find that many of them talk about the ministry with Soldiers that chaplains are blessed to be able to perform or provide. Other posts will deal with difficult topics and struggles while many others will show what there is to see and do in the “host” countries while off-duty. Read what you enjoy or appreciate, skip over what doesn’t interest you but either way, thanks for stopping by and for your support of the Soldiers, Sailors, Airmen, Marines and Coast Guardsmen who serve around the world, distant from home, often away from family and usually just a few steps from harm’s way. 1Headquarters, Department of the Army. FM 1-05: Religious Support, October 2013, page 1-7. 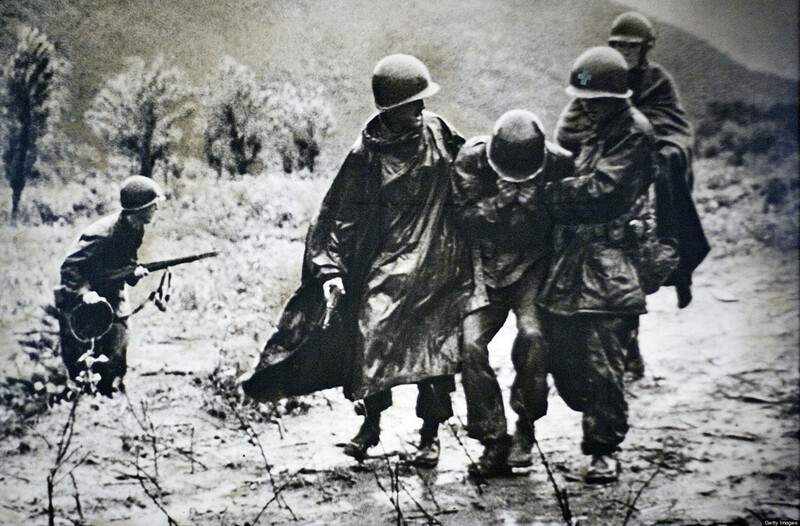 SOLDIERS IN RAIN, This is a copy of a photograph that is on display at Kapaun-Mt. Carmel High School of Korean War Chaplain, Father Emil Kapaun (right) helping a wounded soldier. Kapaun, a Kansas native, served as a chaplain in World War II and the Korean war, where he died as a prisoner of war in 1951. (Photo by Mike Hutmacher/Wichita Eagle/MCT via Getty Images). DEMILITARIZED ZONE (DMZ), South Korean soldiers and a tank stand guard at an observation post near the Han River north of Seoul on April 17, 2013. 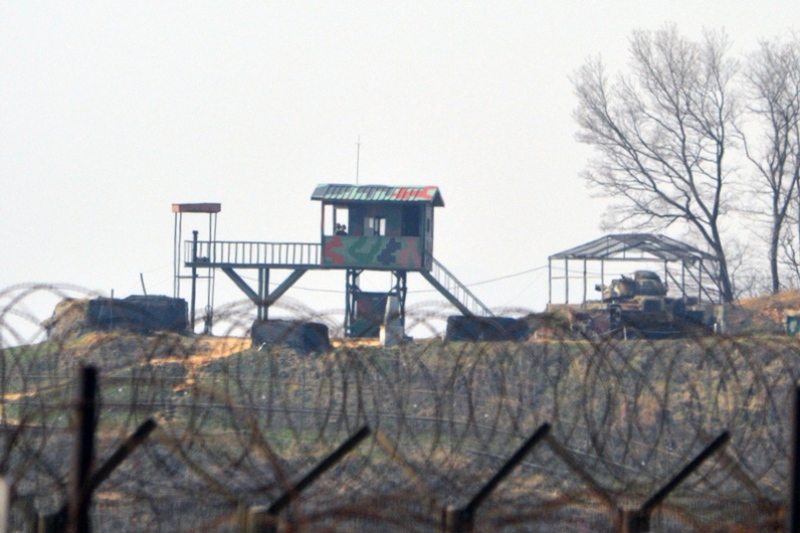 Posts, bunkers and double barbwire fences are common sites along Korean National Route No. 77, near the DMZ (ARMANDO R. LIMON/STARS AND STRIPES. From a Stars & Stripes article).